Tommy joined the club in 2009 and has performed well in both the junior and senior teams. Never shy of a shot with sometimes success. The club went to great expense for his shooting practice. Marauding wing back for seniors and played every junior game in 2010. Fond of the odd long range score. Likes the spectacular score and cross field pass, Padraig cemented his place in the corner with some fine displays. Val had an outstanding year at midfield. Played on the Junior Championship winning team of 2000. 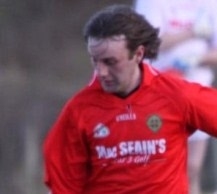 Another surviving member from 2000.Had a great year at full back and also heavily involved in underage teams. Scored some spectacular points for the juniors. Made centre half back his own, a bright prospect for the future. A play-anywhere footballer, Wayne represented the club at minor, junior and senior ranks this year. Another one fond of the long range shot. The talker of the team, 'Taz' made some outstanding saves in goals for the Reds and represented Cavan Juniors this year. Also led the line for the juniors.